1. Cut meat into 2-inch pieces; removing any gristle and most of fat. To make marinade, combine next 10 ingredients in bowl. Add meat and let stand, in bowl or recloseable plastic bag, in refrigerator at least 3 hours, or overnight. Turn occasionally. 2. When ready to cook, peel onions and remove stems from mushrooms. 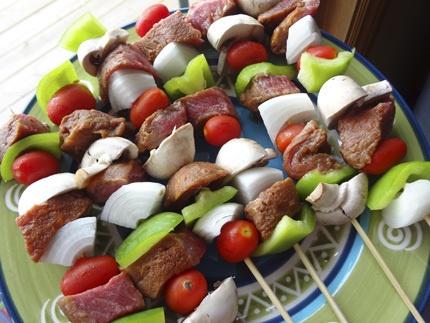 Alternate marinated meat with vegetables on 6-inch metal skewers. Add tomato sauce to remaining marinade to make barbecue sauce; brush over vegetables and meat. Broil over coals or in oven broiler 3 inches from heat source until meat is tender, about 15 minutes. Brush frequently with sauce and turn skewers to brown kebabs. Serves 4 to 6.